The pace of development and advancement in processor and chip technologies can be a tad frenetic. Only six weeks ago, Intel raised the bar for desktop computing with the introduction of the Core i7 980x six-core processor. Now, AMD is playing (almost) catch-up with its new Phenom II X6 1090T six-core processor. I say "almost" catch-up because the AMD six-core processor lags behind the Intel processor architecture in virtually every quantifiable measurement of a CPU except one--price. However, when you factor it all together--including the price--the AMD still offers enough performance to make a compelling case for saving some money and choosing the Phenom II over the Core i7. According to the AMD press release "AMD Phenom II X6 processors feature new Turbo CORE technology that transfers performance to three dedicated cores operating at higher frequency. AMD Phenom II X6 processors can shift to Turbo mode for demanding games and productivity software which may employ two or three cores, or shift back to six real cores for the demands of core-hungry content creation and immersive 3D applications." 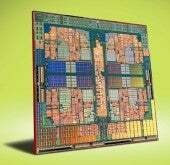 The AMD processor is built on 45nm technology, while the Intel is a 32nm chip. The AMD has only 6Mb of L3 memory cache, while the Intel has 12Mb. Most importantly for performance, though, the AMD lacks Intel's proprietary architecture innovations such as Hyper Threading--which virtualizes the cores to effectively double the number of processing cores the system has to work with. The Intel is the better overall processor, with the faster architecture innovations, lower power consumption, and superior performance. But, the Intel processor retails for $800 more than the entry-level Phenom II X6, and it requires a newer motherboard socket architecture--potentially increasing the initial investment. The AMD Phenom II X6 processors will work with existing AM3 and AM2+ sockets after a simple BIOS upgrade. The barrier to entry for the six-core AMD processor is simply the $200 or $300 it costs to purchase the new CPU and drop it into an existing system. "With AMD Phenom II X6 processors, discerning customers can build an incredible, immersive entertainment system and content creation powerhouse," said Bob Grim, director of Client Platform Marketing at AMD in the press release. "AMD is answering the call for elite desktop PC performance and features at an affordable price." For small and medium businesses, though, the advantages of the Intel Core i7 980x processor may not result in a substantial difference in system performance. Most desktop applications are not designed--at least not yet--to take advantage of the multiple processor cores. While the Intel is the clear winner for graphic and processor intensive businesses, most normal desktop applications will not benefit enough to justify the cost difference.